Fluorescent Minerals and Rocks: How Do They Work? Have you ever been to a mineral or gemstone exhibit in a natural history museum? If so, you might have found yourself at one point inside a dark room with a set of glowing fluorescent stones. They were probably bright and colorful, and appeared to be glowing with their own light. 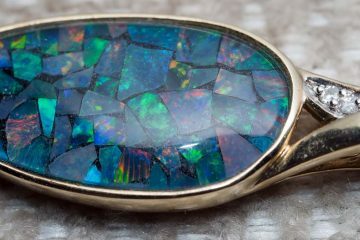 The luminosity allowed you to see the patterns in the stones clearly and easily. The room may also have had standard lighting which could be switched on and off. If this was the case, you probably noticed a lot of those stones looked totally different under normal light. Anything that is visible to your eye is capable of reflecting light. Fluorescence is a special quality some minerals possess. A fluorescent mineral is able to absorb a small amount of light at a particular wavelength, and then release a small amount of light a moment later at another wavelength. Under ultraviolet light, this effect is most pronounced. UV light is not a part of the visible spectrum for human beings. That’s why the room the fluorescent stones are in appears dark when the UV lights are on. 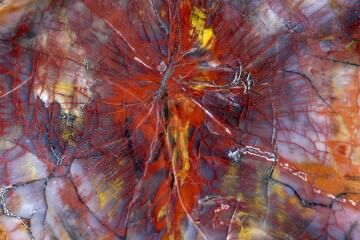 But the light which is released by the minerals on exhibit is visible’and the contrast is stunning. Fluorescence should not be confused with phosphorescence, which is a different atomic process. Phosphorescent minerals also include excited electrons, but those electrons remain in their higher state for a longer period of time. If you turn off the UV light, the phosphorescent mineral may continue glowing for a few moments longer. The fluorescent mineral on the other hand will immediately go dark. Thermoluminescence and triboluminescence are also two different things. The first is the ability of a mineral to emit visible light when heated. The second is the ability of a mineral to glow when it is crushed, scratched, or otherwise acted on by a mechanical force. This effect is generally quite subtle and requires close observation in darkness. Interested in how this process works on an atomic level? It all starts with a photon of light. This particle of light strikes an electron inside the mineral. Electrons around an atom of a particular element rest at valence levels, which is the scientific name for the different orbits around the atom where electrons reside. When the photon strikes an electron, the input of light energy excites the electron to a higher valence level. This is a temporary effect, however, and the electron soon falls back down to its previous orbit around the atom. When an electron falls down in valence, it releases energy (the opposite of the process which excited it to a higher orbital initially). This means the electron now releases some of its stored energy by emitting a new photon. The released energy has a longer wavelength, so this results in a difference in the light which we perceive’and in short, that glowing effect under UV lights. Fluorescence is a fairly common trait for rocks. But still only a minority of minerals exhibit it. Around 15% have the ability to fluoresce, but not every rock you pick up belonging to this 15% will actually do it. In order for it to work, there have to be impurities in the mineral, known as activators. Activators are generally metal cations like lead, boron, manganese and chromium. Organic materials may sometimes act as activators as well. The activators must be present only in small amounts. In large amounts, they may actually reduce the fluorescence of the mineral. Sometimes other types of defects can cause fluorescence as well, like special crystal structures inside of minerals. Other impurities can actually prevent fluorescence or reduce its effect, like iron and copper. Calcite commonly is fluorescent, and sometimes gemstones like ruby, diamond, opal, and kunzite fluoresce as well. And of course, there is also fluorite. George Gabriel Stokes first observed in 1852 that this mineral glowed blue under UV light. The word ‘fluorescence’ is derived from the name of this mineral. Fluorite is so fluorescent that you can sometimes take a piece outside in the sunlight, and then move it into the shade, and see the color change, even without a UV light. Blue or indigo are the most common colors for fluorite to glow. But some may show a white color instead. 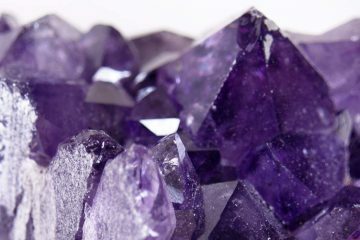 And even with fluorite, not all rocks will actually glow. 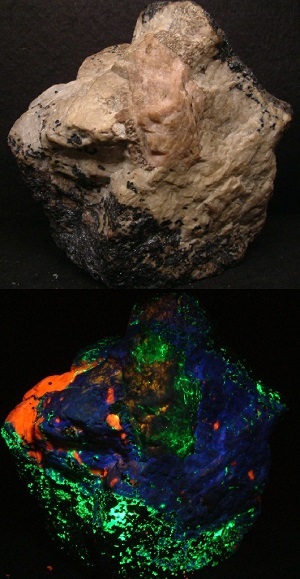 Fluorescent minerals are not only pretty to look at, but they also have industrial applications as well. 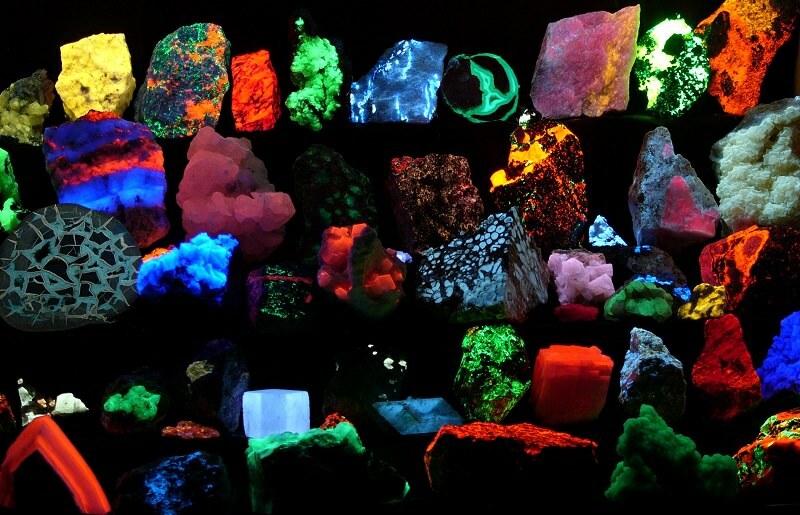 For example, lamps have been made to identify fluorescent minerals. These lamps may be used in mines to help prospecting miners to identify ores. Sometimes geologists also carry them when they are out searching for minerals in the field. 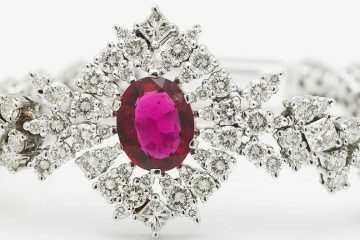 Some precious gemstones also glow under UV light, so carrying this kind of lamp can aid in their discovery. If you have fluorescent minerals, or want to discover whether you do, you can purchase an ultraviolet lamp. To achieve good results, you will need to purchase a scientific-grade lamp, not a ‘black light’ like you can find at a hardware store. Nonscientific-grade lamps do not produce the short-wave UV light which is necessary for studying minerals. The long-wave light they produce is safer for long-term exposure, but not adequate for this use. They also emit visible light which interferes with the process. Scientific-grade lights on the other hand block most visible light and may be designed to produce mid and short-wave UVB and UVC light. If you buy a scientific-grade UV light, you must follow the safety instructions carefully and avoid long-term exposure. Short-wave UV light causes sunburn and radiation damage and can increase your risk of cancer. Always wear long sleeves and gloves, and cover as much of your skin as possible. Wear safety goggles or sunglasses with UVB filtering, and never look directly into the lamp. Make sure nobody else does either, including children and pets, who may not understand the danger the lamp poses.